The urbanity has given new definition to triad relationship of food, shelter & habitat and has become far more complex process. The recent private/public band wagon of affordable housing agencies are yet another attempt to generate land ownership pattern. The attempt is to prove the affordability by numbers that are acceptable by scheme definition and develop its own market strategy to promote. Hence the affordable housing is a marketing strategy for unforeseen pattern of capital building. The recent launch of several schemes and its promotion suddenly raises the question on why developers are turning into philanthropic utopias?.The share market has seen phase of slump and as a ploy it is energize the market, the investors are lure to invest in defensive market and subsequently the market manage to gain some capital mobility. Its similar attempt in the real estate where mobility is constrained the affordable becomes buzzword to create capital mobility. The affordable housing is deceptive as one gets closer to understanding of the feasibility. The land cost is the main factor while material cost is the least factor. The only factory has little value is labour cost. The planning objective perhaps have most insignificant value. 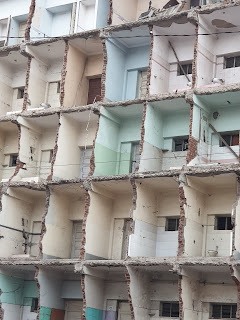 Every country has clear definition of what is affordable housing, while in India, its perhaps very clearly understood and not defined is that its far from city and un-affordable to travel to work long distance. The real understanding of affordability is in economic opportunity as a social security which goes beyond the norms of price of a unit. The western countries have clear definition that "if you spend less than 30% of your income on housing it belongs to affordable range". The only reliable example in Indian context is the housing loan which is calculated based on 30 times of your monthly income. Hence it defines the affordability which is based on income and expenditure (everything). The ration defines the affordability, while low cost is completely different areas and group. However the affordable housing has become the unchecked paradise for investor. It is glaring to note that any affordable housing scheme prices are checked in the beginning during construction and post completion, the prices appreciation is following the similar pattern of normal housing schemes. It is not exaggerated to state that the affordable housing is a disguise for land acquisitions in peripheral areas. It also to create vast land bank for controlling future growth by restricting affordable housing, which in turn becomes seamless part of metros.